Home/ Colchester Castle Park has something for everyone! The Castle Museum, Hollytrees Museum, Play Park, Cafe, Crazy Golf and Bandstand are located in the Upper Park next to the Town Centre. Both are Grade II listed buildings and the Upper Park lies inside the Conservation Area of the Town Centre. The Lower Park is adjacent to the cricket ground and expands downwards to the River Colne. The park really has something for every age group. The play park, bouncy castle, crazy golf and boating lake are a real hit with the young (and the young of heart). The bandstand, gardens and museums can be enjoyed by all. One of the nicest things to do on a summers day is pack a picnic, take some out door games, chairs, etc and then find a spot on the grass in either the upper or lower park and make an afternoon of it. In fact this is becoming more and more popular and you often see families holding parties on the lower park. The park is blessed with many benches. That means you are never far away of being able to find somewhere to sit down, enjoy the view and people watch. I would recommend the benched situtaed near the bandstand as they offer great views across the park with the benefit that you can grab a take-away tea from the Cafe in the Park. On the basis that Colchester was mentioned by Pliny the Elder before his death in AD79, it claims to be the oldest town in Britain and its heritage can be seen by over 2000 years of history in Castle Park. Not only can you enjoy the history of this amazing park, but also the award winning horticulture that the various gardens within the park have to offer. So whether you want to visit the museums and gardens or just relax and enjoy your free time by sitting, walking, enjoying music, picnicking or playing games in an expansive oasis of green and nature, Colchester Castle Park is the place to be. Make sure to check the Calendar page to see what events are up and coming. Remember that a number of them are FREE. Dogs are allowed on a lead in the lower Castle Park. Dogs are not permitted in the upper Castle Park. Please be mindful of other park users and ensure that you clean up after your dog. 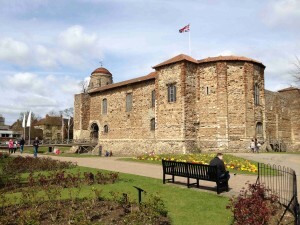 Up until March 2012, not cycling was allowed in Colchester Castle Park. However, a shared cycle lane has now opened on the path that runs alongside the river between middle mill and Leisureworld. It is important for cyclists and pedestrians to be aware of this shared use so as to avoid accidents.